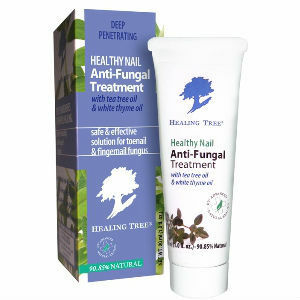 Healing Tree’s Healthy Nail Anti-Fungal Treatment treats nail fungus. It is a safe yet highly potent treatment that contains all-natural ingredients to help you become fungal-free in a hurry. A free nail file is included in this package, and user reviews and testimonials are fantastic, making it a great option in a competitive market. Healthy Nail Anti-Fungal Treatment contains both chemical compounds that have been clinically tested, medically acclaimed, and FDA approved to produce great results, as well as all-natural medications for irritation and safe healing of the nails. Benzethonium Chloride is a very strong yet safe antifungal which fights yellowing, cracked infections at the source and ensures that fungus does not regrow. Tea Tree Oil is a natural ointment that fights against irritation and ensures healthy skin and nails during the regrowth period. This oil has been used for years in holistic medicine to treat fungal infections, and is highly effective. White Thyme Oil is a natural antifungal and antibacterial which works with the other ingredients to fight away fungus. Jojoba Oil is a highly effective penetrating moisturizer found in nature that helps nails get the moisture they need to regrow effectively. Healing Tree uses these products and only these products. They do not use anything harmful or any useless additives, such as alcohol, paraffin wax, fragrances, petroleum, or animal products. This helps you heal naturally, quickly, and irritation-free. Healthy Nail Anti-Fungal Treatment should be applied once or twice daily. When symptoms dissipate, users can apply only once daily, but they should be sure to continue use for the nail’s entire regrowth cycle, usually 3-12 months, to guarantee long-term results. Because Healing Tree does not use any additives or harmful chemicals, side effects are rare. However, some users have reactions against the active ingredient or some of the natural ointments, including irritation, redness, or discoloration. From Healing Tree, you can find a 1 oz bottle for $15.95. Though it cannot be found easily with other vendors, this is an affordable and reasonable price for what you are getting. Should You Try Healing Tree Anti-Fungal Treatment? Healing tree boasts a 90.5% natural product that is safe and effective in treating nail fungus. However, this product is not widely available in many stores and lacks discounts and guarantees. Jack Stevens	reviewed Healing Tree Anti-Fungal Treatment	on September 18th	 and gave it a rating of 3.5.